Democrats in the California State Senate Thursday confirmed former Sen. Isadore Hall (D-Compton) to the Agricultural Labor Relations Board on a party line vote. “Are you the mother******s here to testify against me tomorrow?” Hall then allegedly said, “I have a memory and I am going to get you,” delivering a threat. My sources said Hall dropped the mother*****r F-bomb numerous times in a hair-raising, threatening tone to the farmers. Despite this egregious, unprofessional and likely unlawful behavior, Democrats made it clear during Senate debate they saw nothing wrong with Hall’s behavior and in fact, sang Hall’s praises during floor debate. And that’s the problem with these Democrats; they don’t see that Sen. Isadore Hall threatening private citizens is a violation of the Senate Standards of Conduct, and likely against the law. California Penal Code Section 422 — California’s law on criminal threats, makes it clear that it is prosecutable if you intended that your statement be understood as a threat, the threat was so clear, immediate, unconditional, and specific that it communicated to the person being threatened a serious intention and the immediate prospect that the threat would be carried out; the threat actually caused the person to be in sustained fear for his/her own safety or for the safety of his/her immediate family; the threatened person’s fear was reasonable under the circumstances. Hans Christian Anderson’s “The Emperor’s New Clothes” is a tale about a situation in which people fear to point out an obvious truth that most everyone else seems to think is good or important. In the tale, a vain Emperor who cares nothing about governing, and only about wearing and displaying fancy clothes, hires two weavers who promise him the finest suit of clothes from a fabric invisible to anyone who is unfit for his position, incompetent, or “hopelessly stupid”. The Emperor’s ministers cannot see his new suit of clothes themselves, but pretend that they can out of fear of appearing unfit for their positions, as does the Emperor. 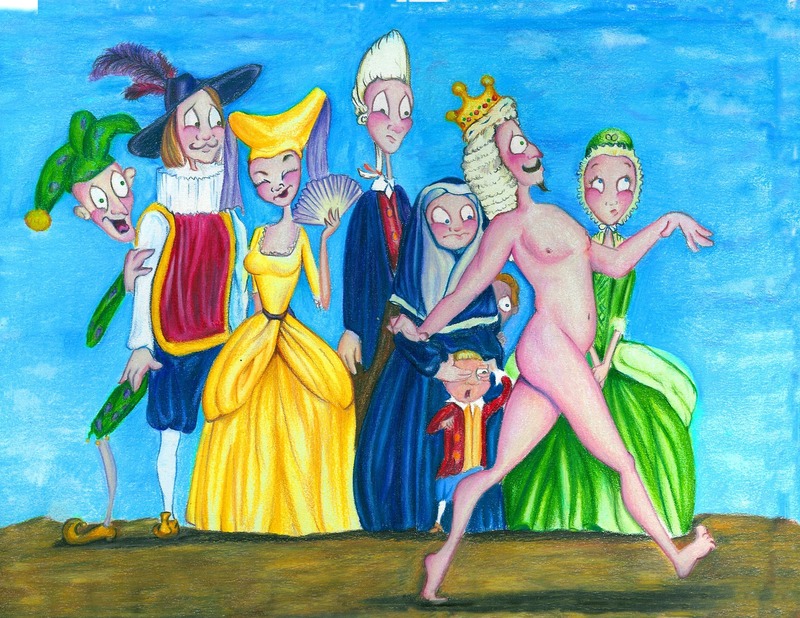 Finally, the weavers report that the suit is finished, they mime dressing him, and the Emperor marches in procession before all of his subjects – buck naked. The townsfolk play along with the pretense, not wanting to appear unfit or hopelessly stupid. However, a child in the crowd too young to understand the absurdity of keeping up the pretense, blurts out, “But he hasn’t got anything on.” And the obvious is finally voiced by the other townspeople, as well. ”But he hasn’t got anything on!” the whole town cried out at last. This tale embodies Democrats in the California Legislature, never wanting to appear unfit for their positions, incompetent, or hopelessly stupid. Attorney Anthony Raimondo, who represents many of the Gerawan Farming workers who have been fighting the ALRB for years, and don’t want to be forced into the United Farm Workers labor union, challenged the members of the Senate Rules Committee during Hall’s hearing, on whether Hall had the capability to avoid the appearance of bias when he marched with the UFW, and was photographed waving the UFW flag, and embracing UFW President Arturo Rodriguez. “Can you assure them (the workers) they should believe cases will be heard impartially by Mr. Hall at the ALRB?” Raimondo asked. Describing Sen. Isadore Hall as “fair minded,” Sen. President pro Tem Kevin de León insisted that an investigation had been done, claimed that he had “reached out to farmers and growers,” and all was well with the world and Hall’s pending confirmation. Yet, the farmers present for Hall’s obscenity-laced tirade did not speak out and report this episode the very next morning at Hall’s confirmation hearing to de León, who is the committee chairman. It would have been the perfect opportunity to get the skunk on the table, and describe Hall’s outrageous thug behavior. “I know him to be a highly qualified individual for this post,” Sen. Ben Hueso (D-San Diego) said. And then he accused all opposed to Hall’s confirmation as “racially motivated,” as Hall is black. This isn’t Hall’s first foray into thuggary. In June, then-Sen. Isadore Hall insulted and provoked opponents of numerous gun-control bills during committee hearings. “These crazy, vicious, heartless individuals, who come here and defend the senseless act of terror… They are protecting the vicious murderers,” Sen. Hall said, directing his comments to Daniel Reid with the National Rifle Association’s Institute for Legislative Action, and Sam Paredes with Gun Owners of California, who opposed Hall’s gun control bills. “They care more about the ability to hold a weapon in their hands,” Hall added. “They need to wash their mouths because they are filthy,” when they testified that Hall’s bills would not save lives. Sen. John Moorlach (R-Costa Mesa) said he looked up the word “cronyism” and felt it applied in the case of Sen. Hall’s appointment and confirmation to the agricultural labor board: “the appointment of friends and associates to positions of authority, without proper regard to their qualifications.”Moorlach nailed it. California’s boards and commissions are merely where termed-out legislators go when they need a paycheck while they plot their next campaign, as is the case of Isadore Hall. Isadore Hall lost his 2016 race for the congressional seat vacated by Rep. Janice Hahn, to Nanette Diaz Barragan. Since Hall plans to run again for the seat, he may want to study up on the House of Representatives Code of Official Conduct. Yet because Hall promised to tackle ALRB issues in an “inclusive, methodical and transparent way,” and to be “a voice for working families and for business,” Democrats ignored the pleas from Republican colleagues to investigate the matter(s), even with the idea of clearing Hall’s name. In “The Emperor’s New Clothes,” the king is so arrogant and infatuated with himself that when his cronies tell him he’s doing good he believes it, even when he knows it isn’t true. The tailor told the emperor and everyone else that only intelligent and refined people could see the cloth, while it would be invisible to stupid, cloddish people. When no adult would speak the obvious that the king was naked, they weren’t sucking up to the king; they were afraid to show themselves as hopelessly stupid. It was their arrogance and smugness that made them lie. And it was their arrogance and smugness that made Democrats vote for Isadore Hall, even when they all know he behaved like a thug, and will work against the rights of farm workers and growers who do not want to be unionized. Senate Democrats have no clothes, nor the moral principles that govern a person’s behavior.